Dino Laurenzi, L-ATC, MA, MBA, TRX Trainer, graduated from the University of North Carolina with a degree in Sports Medicine and Athletic Training. He has worked with clients ranging from professional to fitness athletes. Dino has developed various sports medicine and athletic performance training programs to assist his clients to achieve better performance and improved fitness. Dino is currently the Director of Rehabilitation at United Hospital System. Core training is a very important aspect of an exercise routine for athletes. When incorporated into a proper workout routine it will help improve neuromuscular control and hopefully reduce injuries. The trunk of the body is considered the core and is comprised of the abdominal muscles, back muscles, pelvic floor muscles and the diaphragm. The core is the basis for all functional movements in sports, and is crucial for everything from cutting, to pivoting, to throwing, etc. Its main purposes are to allow for balance & stability, absorbing force and for the transfer of force/energy to the extremities. The transfer of force/energy affords the athlete the ability to generate additional power with various athletic activities such as a golf swing or a punch. 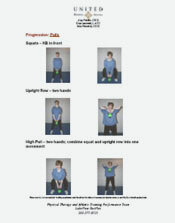 Incorporating proper technique and core training into a routine will facilitate improved neuromuscular athletic movement patterns which can help with maintaining correct alignment and stability of the spine and pelvis while performing an athletic activity. It will also help the athlete become more efficient with the execution of movements. The strength or weakness of the core will determine the athlete’s ability to move and generate power efficiently while participating in sport. Having good core strength, stability, and efficient dynamic neuromuscular control will facilitate the opportunity for improved sports performance. Athletic movement patterns are variable and dynamic, and require proper neuromuscular training to respond and react to loads placed on the body. Training can be accomplished using a variety of methodologies and equipment. 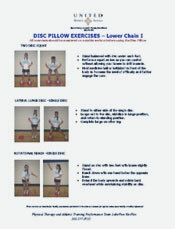 Below are handouts of core training exercises which incorporate the use of the stability ball, medicine ball, disc pillow and kettle bell.